The purpose of the Floodplain Ecology Course is to promote awareness and greater understanding of these complex ecosystems in a drying climate, their ecological importance and values, the intimate connection of floodplains with the health of their parent rivers, and how in a volatile political setting consideration of floodplains is important to the long term sustainable use of our waterways. The course is a week-long, high intensity, fascinating and fun experience. Biogeochemical processes and functions on the floodplain. Specifically, the Floodplain ecology. provide examples of practical skills in observation, description, survey/assessment, analysis, interpretation, and assessment, of geomorphological features, hydrological regimes, soils and flora and fauna on floodplains. The focus of the course will be on the floodplains of the Goulburn – Murray system in the region of Barmah. 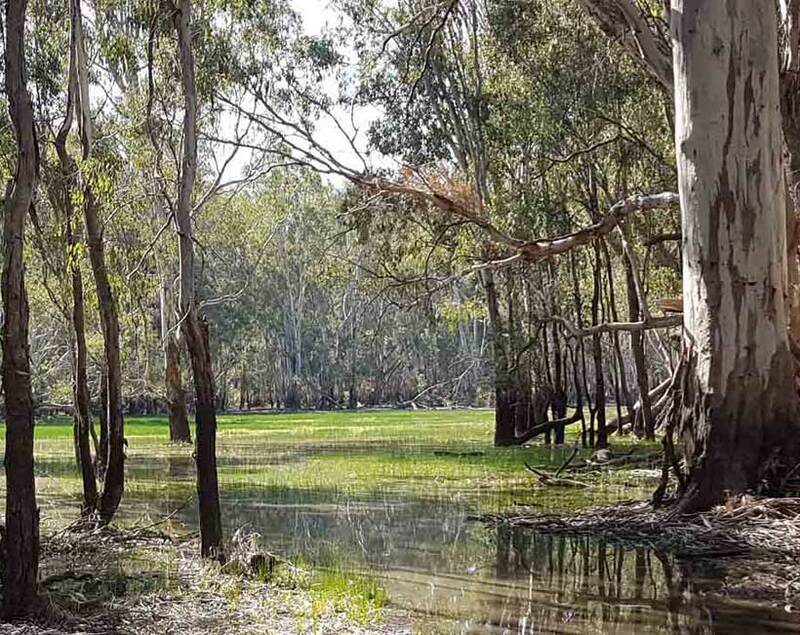 Keith Ward is a wetland ecologist whose main areas of research have been the vegetation, waterbirds and frogs of Barmah-Millewa Forest and fish and water bugs of the Hattah Lakes system near Mildura. Neville Rosengren has surveyed the geomorphology and geology of conservation sites in most parts of Victoria. He is particularly interested in the modes and dynamics of landscape evolution. Damien Cook is a restoration ecologist with a keen interest in plant and frog taxonomy, wetland ecology and the processes which lead to the degradation of natural ecosystems and how these can be reversed. He has studied natural history for over 25 years and has worked as an ecologist, project manager and environmental educator for the last 20 years. Cath Botta is a soil scientist and educator who works with communities in agricultural landscapes. Her special interest is in helping people better understand their own soils and the effects of land management on soil health. Steve Wilson is Land and Biodiversity Manager at the Goulburn Broken Catchment Management Authority. He has an extensive working background in wildlife and natural resource management. Darren Baldwin is an aquatic ecologist/bio geochemist with over 20 years post-doctoral experience. Much of Darren’s research to date has centred on how perturbations affect the way that energy and matter move through and are transformed in aquatic ecosystems. Lindy Lumsden is a wildlife biologist with a passion for bats, their ecology, and introducing them to people. In recent years Lindy’s research has focused on rural landscapes, investigating the distribution, ecology, and habitat requirements of insect-eating bats. Katie Howard is a herpetologist at ARI and a major focus of her research is on freshwater turtles along the Murray River. Daryl Nielsen is a freshwater ecologist whose primary research includes the ecology of microfauna in wetlands and riverine environments. His current activities include examination of the impacts of secondary salinisation on dormant eggs and seeds of aquatic organisms. The course is based at Barmah in River Red Gum floodplain country. Accommodation will be shared, in comfortable on-site units at the Morning Glory River Resort Gilmour Rd Moama, with shared bathroom & kitchen facilities. Catering is inclusive of all meals. The course fee for 2019 is $1600 (plus GST) which includes accommodation, meals, transport during the course, instruction, and course notes. Bookings are now open for the 2019 course. The course is limited to 25 participants. Further details, including the Course Notes, will be given out to registered participants, closer to the date.